I've got a 2000 Honda Accord with almost 150k miles on it. Something is wrong with my suspension and I'm not sure what it is. Here are the symptoms. 1. For the past couple of months, the steering wheel will start to shake when going 70+ MPH. 2. Clicking sound can be heard on front driver side when driving straight, around turns or over bumps. Oddly enough, the clicking sound was almost non-existent during the winter months (I live in northeast Ohio) and now that it's warm out I hear it everywhere I go. 3. When pushing down on the hood above the front left tire clicking sound can be heard . . . not sure how to describe it exaclty; a squeaky clicking sound? Here's where I'm stuck. I've had two shops tell me that the upper ball joint needs to be replaced, but over the course of the past two years the upper and lower control arms have been replaced on the car so I would like to think that it's not the ball joint. Friends/coworkers of mine who are far more car savvy then myself are leaning more towards struts and springs. Does anybody have any suggestions as to what the problem could be? 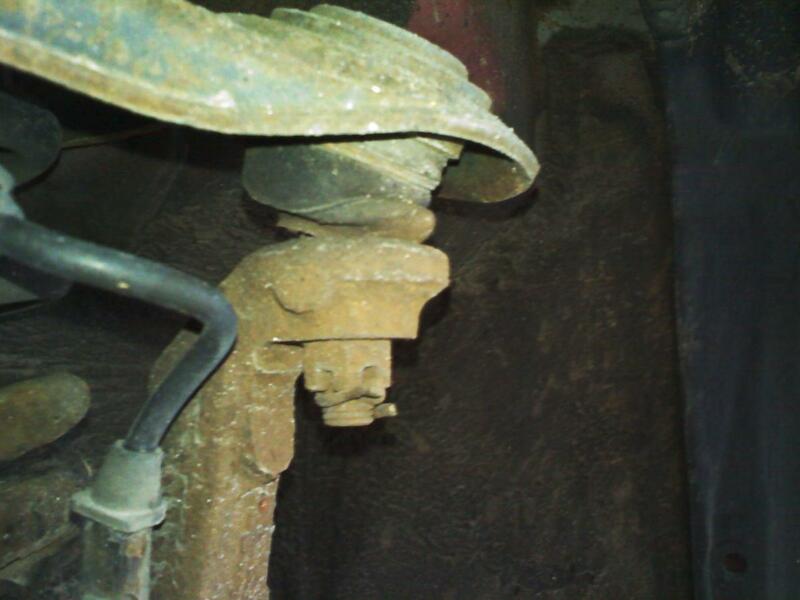 I took the tire off this afternoon to get a better look at the ball joint (I attached the picture). A good way to test the struts is to push down on the car where you think the problem is, IE front driver side. The car should just pop right back up to drive height. If it sort of hops up and down then the strut is likely bad. Over 70+mph could be a tire that is out of balance or an alignment that is needed. Or it could have to do with your other problems. Normally clicking sound while driving would make me think CV joint, but it wouldn't make the sound when the car isnt moving. A good way to test the struts is to push down on the car where you think the problem is, IE front driver side. The car should just pop right back up to drive height. If it sort of hops up and down then the strut is likely bad. - The car pops right back up to drive height. Over 70+mph could be a tire that is out of balance or an alignment that is needed. - Alignment was done in February. maybe so but no one said the alignment was done right.. just saying.. i had an alignment done at the honda dealership, it sucked, then changed my tires like two weeks later, guy at mavis said the alignment was bad, had it done again, it still sucked, then complained to honda and they did it again.. not very much noticeable vibration now except when braking..
like i said, just cuz you paid, doesn't mean they did anything except collect your money.. unless you saw them do the alignment or you did yourself..